Bijou girls I have you spotted the new Free People Limited Edition Summer Dress Collection? Not strictly Wedding dresses but they would suit the bohemian Bride down to the ground and are very reasonably priced, all under £500. The Free People wearer should be “free and adventurous, sweet to tough to tomboy to romantic. A girl who likes to keep busy and push life to its limits, with traveling and hanging out and everything in between“, sound like you? If you are an Urban Outfitters shopper, Free People is its sister chain and has the same laidback mentality. Here’s the pretty. The Jill dress is loaded with delicate details and hundreds of buttons, swoon. 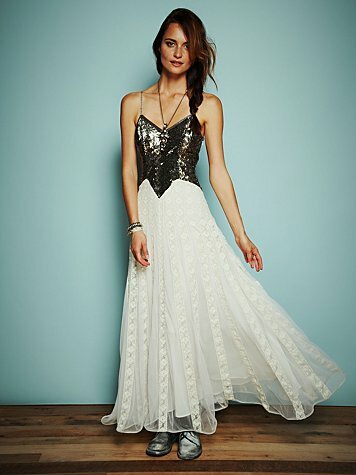 The empire style of this Kristal Free People dress would make it a funky, bohemian alternative for pregnant Brides. 70’s vintage style with the Ana dress, match with a flower crown for a relaxed hippy vibe. The train on this dress makes it totally Bridal worthy. The Kristin’s bronze embellished bodice is sure to turn heads and would suit an Art Deco inspired Bride too. Free People ship internationally so get shopping now.